I’ve just finished reading Blown to Bits: Your Life, Liberty, and Happiness After the Digital Explosion, by Hal Abelson, Ken Ledeen, and Harry Lewis, and it’s another title worth adding to your tech policy reading list. The authors survey a broad swath of tech policy territory — privacy, search, encryption, free speech, copyright, spectrum policy — and provide the reader with a wonderful history and technology primer on each topic. In that sense, most chapters discuss how technology and technological change can be both a blessing and a curse, but the authors are generally more optimistic than pessimistic about the impact of the Net and digital technology on our society. What follows is a quick summary of some of the major issues covered in Blown to Bits. These are issues I discussed in more detail in my recent review of Daniel Solove’s important new book, Understanding Privacy. Abelson, Ledeen, and Lewis are right to point out that these tensions are only going to increase in coming years and their chapter outlines many of the new fault lines in the debate over online privacy. Actually, I’m not sure there really was a “privacy fervor that permeated the crypto wars a decade ago.” Many of us who argued passionately for crypto-freedom back then knew it was unlikely that the masses were going to rush right out and start encrypting all their mail the minute the policy battle ended. In reality, most of us live pretty mundane lives and just don’t care enough to go through the hassle of encrypting the random chatter of e-mail. But it was the principle of the matter that counted — the government should never be given the keys to unlock all private communications. That is what we were fighting about in the crypto wars — not the necessity of everyone encyrpting every e-mail they sent. Importantly, however, the authors correctly note how the truly beneficial result of the fight for crypto-freedom was an explosion of online commerce, facilitated by behind-the-scenes crypto protecting our transactions. Amazon, eBay, and many other e-commerce vendors, both big and small, have prospered because of strong crypto. That was the security blanket many of us needed before we were willing to take the plunge and begin doing most of our shopping and financial transactions online. This is a great public policy success story, and Abelson, Ledeen, and Lewis do a wonderful job relaying it to the reader. Abelson, Ledeen, and Lewis go on to outline the dangers of online censorship and the importance of defending the First Amendment from new legislative and regulatory attacks, but they would have done well to cite the growing diversity of parental control tools and methods that are now on the market. I share their passion for defending free speech values, but it is equally important we work hard to show parents and policymakers how many effective self-help tools and strategies are out there on the market today to help them guide — or even control — their child’s media and Internet experiences. Not everyone is equally excited about what a world of media abundance offers us, or out children. If we hope to continue to fend off attacks on the First Amendment, we have to make sure parents are empowered to mentor their kids and limit access to content they find objectionable so they don’t expect Uncle Sam to play the role of national nanny. I hope policymakers are listening — especially the many stubborn state attorneys general who continue to push age verification as a silver-bullet solution to online child safety concerns. These were facts of the technology of the time. They were true, but they were contingent truths of engineering. They were never universal laws of physics, and are no longer limitations of technology. Because of engineering innovations over the past 20 years, there is no practically significant “natural limitation” on the number of broadcast stations. Arguments from inevitable scarcity can no longer justify U.S. government denials of the use of the airwaves. I completely agree, although challenging questions remain about how to get us out of the current mess. Abelson, Ledeen, and Lewis argue that “commons-based” approaches make the most sense. I am certainly open to the idea of treating certain swaths of spectrum as a commons, but it’s important to recognize that this does not necessarily get the regulators completely out of the picture. In fact, as my TLF colleague Jerry Brito has persuasively argued, there is the real potential that the FCC could become an aggressive device regulator if we switch to this approach. “A ‘commons’ model is not a third way between regulation and property, it is just another kind of regulation,” Brito concludes. That’s why I continue to believe that a property rights-based approach for most spectrum allocation makes the most sense and will get the spectrum deployed for its most highly-valued use. Commons-based approaches should supplement, not supplant, that model. Abelson, Ledeen, and Lewis also fail to sweat the details about how to handle the issue of incumbent spectrum users in the transition to their preferred commons-based model. That strikes me as a pretty big problem. They repeatedly mention how incumbents often seek to block beneficial spectrum reforms — which is no doubt true on some occasions — but that doesn’t mean incumbent spectrum holders don’t have legitimate rights in their existing allocations that should be honored. I would hope that, even if they wanted to go with a pure commons approach going forward, the authors would at least be willing to grandfather-in existing spectrum users. If the goal is to encourage them to vacate what they currently have, incentivize them with flexible use and resale rights. For example, for the right price, a lot of broadcast spectrum holders might be willing to give up their current allotment. Alternatively, if flexible use was allowed, they might deploy their spectrum for a different purpose. Unfortunately, both of these options are currently prohibited by the FCC’s command-and-control regulatory system. Overall, however, I enjoyed the spectrum chapter and found the history and technology primer in this chapter to be the best in the book. The authors make a fair point about the perils of banning technologies to protect copyright. That’s never the right answer. Regrettably, however, they pay less attention to what I regard as the legitimate concerns of copyright holders about how to protect their creative works and expressive endeavors going forward. And it’s not just about protecting large-scale industries, as they and other copyright critics are often prone to claim. It’s about whether or not we want a workable copyright system going forward. Of course, some critics wouldn’t mind seeing copyright law fade into the sunset altogether. But Abelson, Ledeen, and Lewis don’t really make it clear how far they’d be willing to go. They do have a brief discussion about collective licensing approaches as a possible solution, which may be coming sooner than we think for the Net. Unfortunately, they don’t spend much time developing the details. I remain skeptical about the sensibility of that approach — especially since it will likely end up being compulsory in nature and fraught with fairness problems (i.e. Who pays in? How much? On the other end, who gets paid how much when their content appears online? etc.) Nonetheless, I think that’s where we’ll end up before the copyright wars are over, so it would have been nice to see the authors spend more time on collective licensing issues. They also spend a lot of time discussing DRM. I was surprised by their comment that, “Developers of DRM and trusted platforms may be creating effective technologies to control the use of information, but no one has yet devised effective methods to circumscribe the limits of that control.” (p. 212) I must say, that does not seem to match up with the reality of the market we see around us today in which DRM systems are rapidly crumbling and being abandoned left and right. 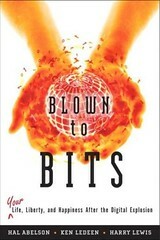 I didn’t agree with everything in Blown to Bits, such as their unfortunate call for Net neutrality regulation. Overall, however, I enjoyed the book and recommend it. The narrative can be a little disjointed at times, almost sounding like a series of e-mail exchanges between friends (which may have been the case since the book had three authors). But the text is very accessible and contains a great deal of useful information to bring you up to speed on the hottest tech policy debates under the sun. If the authors are smart, they’ll throw the book online and update it periodically to keep it fresh. As I have found with my parental controls and Media Metrics reports, that’s the only way to keep up with the frantic pace of change in the tech policy arena — version your books like software and release periodic updates. This book will definitely appear on my big, end-of-year “Most Important Tech Policy Books of 2008” list, which I should have wrapped up shortly. Also, I think this book makes a nice complement to Palfrey and Gasser’s Born Digital, which I reviewed here last month. And, if you are interested in another title that takes an approach similar to what Abelson, Ledeen, and Lewis have taken here, you might want to check out Bruce Owen’s outstanding 1999 book “The Internet Challenge to Television.” It’s an oldy but a goodie, as I noted here. Finally, given the title of the book and the countless times in the text that Abelson, Ledeen, and Lewis talk about the “bits revolution,” how “bits are bits,” and how “bits behave strangely,” shockingly, they never seem to get around to crediting Nicholas Negroponte for his pioneering work on this front in Being Digital. Long before anybody else gave a damn about how the movement from a world of atoms to a world bits would change our entire existence, Nicholas Negroponte was preaching that gospel to the unconverted. And considering he was saying all that back in the dark (dial-up) ages of 1995, the man deserves some credit, as I have noted here before. Previous post: Debate: Does Google Violate its “Don’t Be Evil” Motto?